Base R provides probability distribution functions p foo () density functions d foo (), quantile functions q foo (), and random number generation r foo () where foo indicates the type of distribution: beta ( foo = beta), binomial binom, Cauchy cauchy, chi-squared chisq, exponential exp, Fisher F f, gamma gamma, geometric geom, hypergeometric hyper, logistic logis, lognormal lnorm, negative binomial nbinom, normal norm, Poisson pois, Student t t, uniform unif, Weibull weibull. Following the same naming scheme, but somewhat less standard are the following distributions in base R: probabilities of coincidences (also known as "birthday paradox") birthday (only p and q), studentized range distribution tukey (only p and q), Wilcoxon signed rank distribution signrank, Wilcoxon rank sum distribution wilcox. Beta-binomial distribution : provided in VGAM, extraDistr. ZI/ZM beta binomial distributions are implemented in gamlss.dist. Beta-geometric distribution : provided in VGAM. Binomial (including Bernoulli) distribution : provided in stats . Zero-modified, zero-inflated, truncated versions are provided in gamlss.dist, extraDistr, actuar and in VGAM. LaplacesDemon provides dedicated functions for the Bernoulli distribution. Benford distribution : provided in VGAM. Bernoulli distribution : provided in extraDistr. Borel-Tanner distribution : provided in VGAM. Conway-Maxwell-Poisson distribution : provided in compoisson and CompGLM. Delaporte distribution : provided in gamlss.dist and Delaporte. Dirac distribution : provided in distr. Discrete categorical distribution : provided in LaplacesDemon. Discrete exponential distribution : provided in poweRlaw. Discrete gamma distribution : provided in extraDistr. Discrete inverse Weibull distribution : DiscreteInverseWeibull provides d, p, q, r functions for the inverse Weibull as well as hazard rate function and moments. Discrete Laplace distribution : The discrete Laplace distribution is provided in extraDistr (d, p, r). The skew discrete Laplace distribution has two parametrization (DSL and ADSL), both provided in DiscreteLaplace and DSL in disclap. LaplacesDemon also provides the DSL parametrization only. Discrete lognormal distribution : provided in poweRlaw. Discrete normal distribution : provided in extraDistr. Discrete uniform distribution : can be easily obtained with the functions sum,cumsum,sample and is provided in extraDistr. Discrete Weibull distribution : provided in DiscreteWeibull: d, p, q, r, m for disc. Weib. type 1, d, p, q, r, m, h for disc. Weib. type 3. extraDistr provides d, p, q, r for Type 1. Felix distribution : provided in VGAM. Lindley distribution : provided in gambin. Geometric distribution : provided in stats . Zero-modified, zero-inflated, truncated versions are provided in gamlss.dist, actuar and in VGAM. Geometric (compound) Poisson distribution (also known Polya-Aeppli distribution) : provided in polyaAeppli. Generalized binomial distribution : provided in GenBinomApps. Generalized Hermite distribution : provided in hermite. Hypergeometric distribution : provided in stats . Non-central hypergeometric distribution is provided in MCMCpack (d,r). Extented hypergeometric distribution can be found in BiasedUrn package, which provides not only p, d, q, r functions but also mean, variance, mode functions. Generalized hypergeometric distribution is implemented in SuppDists. 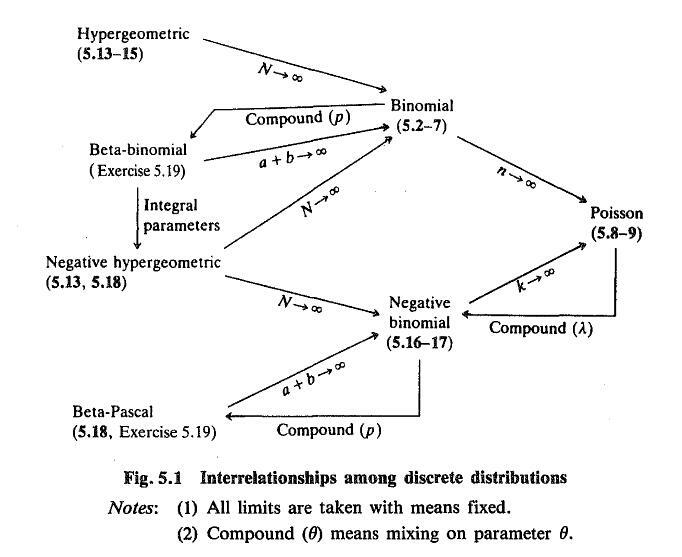 Negative hypergeometric distribution is provided in tolerance, extraDistr. Lagrangian Poisson distribution : RMKdiscrete provides d, p, q, r functions for the univariate and the bivariate Lagrangian Poisson distribution. Lindley distribution : provided in VGAM. Logarithmic distribution : This can be found in extraDistr, VGAM, actuar and gamlss.dist. Zero-modified and zero-truncated versions is provided in actuar. A fast random generator is available for the logarithmic distribution is implemented in Runuran as well as the 'density' function. Poisson distribution : provided in stats and in poweRlaw. Zero-modified, zero-inflated, truncated versions are provided in extraDistr, gamlss.dist, actuar and in VGAM. extraDistr provides the truncated Poisson distribution. LaplacesDemon provides the generalized Poisson distribution. See the mixture section such as the Poisson-lognormal mixture. Poisson-Lindley distribution : provided in tolerance. Power law distribution : provided in poweRlaw. Mana Clash distribution : provided in RMKdiscrete. Negative binomial distribution : provided in stats . Zero-modified, zero-inflated, truncated versions are provided in gamlss.dist, extraDistr, actuar and in VGAM. New parametrization of the negative binomial distribution is available in RMKdiscrete. Sichel distribution : provided in gamlss.dist. Skellam distribution : provided in extraDistr, VGAM and skellam. Waring distribution : sampling in degreenet. Yule-Simon distribution : provided in VGAM and sampling in degreenet. Zeta and Haight's Zeta distribution : provided in VGAM, tolerance. Zipf distribution and extensions : d, p, q, r functions of the Zipf and the Zipf-Mandelbrot distributions are provided in tolerance, VGAM. Package zipfR provides tools for distribution of word frequency, such as the Zipf distribution. zipfextR provides three extensions of the Zipf distribution: the Marshall-Olkin Extended Zipf, the Zipf-Poisson Extreme and the Zipf-Poisson Stopped Sum distributions. Bivariate binomial : d, p functions provided in bivariate. Bivariate geometric : d, r functions provided in bivgeom. Bivariate Poisson : d, p functions provided in bivariate. Bivariate Poisson-lognormal : provided in poilog. Bivariate uniform : d, p functions provided in bivariate. Hyper Dirichlet distribution : provided in hyper2 package. Multinomial distribution : stats, mc2d, extraDistr packages provide d, r functions. r is provided in MultiRNG and compositions. p function is provided by pmultinom. Multinomial Dirichlet distribution : functions d, r are provided in MCMCpack, mc2d, dirmult, extraDistr and bayesm. r is provided in MultiRNG. Negative multinomial distribution : A bivariate distribution with negative-binomial marginals is available in RMKdiscrete. The multiplicative multinomial distribution is implemented in MM. Multivariate Poisson distribution : compositions provides a random generator. Multivariate hypergeometric distribution : provided in extraDistr. Multivariate Polya distribution : functions d, r of the Dirichlet Multinomial (also known as multivariate Polya) distribution are provided in extraDistr, LaplacesDemon and Compositional. Multivariate Ewens distribution : not yet implemented? Truncated Stick-Breakin distribution : provided in LaplacesDemon. Arcsine distribution : implemented in package distr. Beta distribution and its extensions : Base R provides the d, p, q, r functions for this distribution (see above). extraDistr provides the beta distribution parametrized by the mean and the precision. actuar provides moments and limited expected values. sadists implements Gram Charlier, Edgeworth and Cornish-Fisher approximations for doubly non central beta distribution for computing d, p, q, r functions. extraDistr provides the four-parameter beta with lower and upper bounds. The generalized beta of the first kind (GB1) (exponentation of beta 1) is provided in gamlss.dist, mbbefd, actuar. The beta prime (or beta of the second kind), which is the distribution of X/(1-X) when X follows a beta distribution of the first kind, is provided in VGAM, extraDistr, LaplacesDemon and mc2d. The zero and one inflated beta distribution can be found in gamlss.dist. The generalized beta of the second kind (GB2) is provided in gamlss.dist, GB2. Several special cases of the generalized beta distribution are also implemented in VGAM, mc2d: Lomax, inverse Lomax, Dagum, Singh-Maddala, Pert distributions. actuar provides the transformed beta 2 distribution which includes as special cases Burr, loglogistic, paralogistic, generalized Pareto, Pareto, see also the Pareto subsection. Benini distribution : provided in VGAM. Bezier-Montenegro-Torres distribution : provided in BMT. Bhattacharjee (normal+uniform) distribution : provided in package extraDistr. Birnbaum-Saunders distribution : provided in package VGAM and extraDistr. Bridge distribution : provided in bridgedist, as detailed in Wang and Louis (2003). The distribution of random intercept that allows a marginalized random intercept logistic regression to also be logistic regression. Box Cox distribution : gamlss.dist provides the Box-Cox normal, the Box-Cox power exponential and the Box-Cox t distributions. Burr distribution : see Pareto. Cardioid distribution : provided in VGAM. Cauchy distribution : Base R provides the d, p, q, r functions for this distribution (see above). Other implementations are available in lmomco and sgt. The skew Cauchy distribution is provided in sn. LaplacesDemon provides d, p, q, r functions for the Half-Cauchy distribution. Chen distribution : provided in reliaR. Chi(-squared or not) distribution : Base R provides the d, p, q, r functions for the chi-squared distribution, both central and non-central (see above). Moments, limited expected values and the moment generating function are provided in actuar. extraDistr provides d, p, q, r functions for inverse chi-squared distribution (standard and scaled). Only d,r functions are available for the inverse chi-squared distribution in package geoR and LaplacesDemon. A fast random generator is available for the Chi distribution is implemented in Runuran as well as the density function. The non-central Chi distribution is not yet implemented. The chi-bar-squared distribution is implemented in emdbook. sadists implements Gram Charlier, Edgeworth and Cornish-Fisher approximations for sums of non central chi-squared raised to powers distribution and sums of log of non central chi-squared for computing d, p, q, r functions. Continuous binomial distribution : cbinom provides the d/p/q/r functions for a continuous analog to the standard discrete binomial with continuous size parameter and continuous support with x in [0, size + 1]. Dagum distribution : see beta. Davies distribution : The Davies distribution is provided in Davies package. (non-central) Dunnett's test distribution : provided in nCDunnett. Eta-mu distribution : provided in lmomco. sadists implements Gram Charlier, Edgeworth and Cornish-Fisher approximations for doubly non central eta distribution for computing d, p, q, r functions. Exponential distribution and its extensions : Base R provides the d, p, q, r functions for this distribution (see above). actuar provides additional functions such as the moment generating function, moments and limited expected values. It also has the d, p, q, r for the inverse exponential distribution. The shifted (or two-parameter exponential) and the truncated exponential distributions are implemented in lmomco and tolerance packages with d, p, q, r functions. Exponential Power distribution is also known as General Error Distribution: d, p, q, r functions for the power and the skew power exponential type 1-4 distributions are implemented in gamlss.dist and lmomco. The power exponential distribution is also provided in normalp, LaplacesDemon and sgt. The skew power exponential is provided sgt. reliaR provides the generalized exponential, the inverse generalized exponential, the logistic exponential, the Marshall-Olkin Extended Exponential and the exponential extension distributions. A fast random generator is available for the power Exponential distribution is implemented in Runuran as well as the density function. Externally studentized midrange distribution : Package SMR computes the studentized midrange distribution (d, p, q, r). Fisher-Snedecor (or F) distribution : Base R provides the d, p, q, r functions for the F distribution, possibly with a non-central parameter. sadists implements Gram Charlier, Edgeworth and Cornish-Fisher approximations for doubly non central Fisher distribution (and product of multiple doubly non central Fisher distribution) for computing d, p, q, r functions. flexsurv provides d, p, q, r functions as well as hazard (h) and integrated hazard rate (i) functions for the generalized F distribution. fpow returns the noncentrality parameter of the noncentral F distribution if probability of type I and type II error, degrees of freedom of the numerator and the denominator are given. Frechet distribution : provided in VGAM, RTDE, ReIns, extraDistr and evd. A fast random generator is available for the Frechet distribution is implemented in Runuran as well as the density function. The truncated Frechet distribution is provided in ReIns. Friedman's Chi distribution : provided in SuppDists. Gamma distribution and its extensions : Base R provides the d, p, q, r functions for this distribution (see above). EnvStats provides d, p, q, r functions of the gamma parametrized by the mean and the coefficient of variation. actuar provides d, p, q, r functions of the inverse, the inverse transformed and the log gamma distributions while ghyp provides those functions for the variance gamma distribution. extraDistr and LaplacesDemon provide the inverse gamma distribution. VarianceGamma provides d, p, q, r functions for the variance gamma distribution as well as moments (skewness, kurtosis, ...). VGAM provides d, p, q, r functions of the log gamma and the generalized gamma distribution. The generalized gamma distribution can also be found in gamlss.dist. reliaR provides the log gamma distribution. See Pearson III for a three-parameter gamma distribution with a location parameter. flexsurv provides d, p, q, r functions as well as hazard (h) and integrated hazard rate (i) functions for the	generalized gamma distribution. coga provides d, p, r functions for a sum of independent but not identically distributed gamma distributions. MCMCpack provides d, r functions of the Inverse Gamma. Gaussian (or normal) distribution and its extensions : Base R provides the d, p, q, r functions for this distribution (see above). actuar provides the moment generating function and moments. The truncnorm package provides d, p, q, r functions for the truncated gaussian distribution as well as functions for the first two moments. mvrtn provides random variates for left/right truncated normal distributions. EnvStats provides d, p, q, r functions for the truncated normal distribution and the zero-modified distribution. extraDistr provides the truncated normal. LaplacesDemon provides d, p, q, r functions for the Half-normal distribution. lmomco implements the generalized normal distribution. The Exponentially modified Gaussian is available in emg, gamlss.dist and retimes. sn implements the skew normal distribution. greybox implements the folded normal distribution. VGAM implements the folded and the skewed normal distribution, and csn provides d, r functions for the closed skew normal distribution. CompQuadForm provides the distribution function of quadratic forms in normal variates. NormalGamma provides the density of the sum of a gaussian and a gamma random variables. NormalLaplace provides d, p, q, r functions for the sum of a normal and a Laplace random variables, while LaplacesDemon provides d, r function of the sum of a normal and a Laplace random variables. General error distribution (also known as exponential power distribution) : see exponential item. Generalized extreme value distribution : provided in lmomco (d, p, q); VGAM, evd, evir, FAdist, extraDistr, EnvStats, QRM and fExtremes (d, p, q, r). evdbayes, revdbayes provide d,p,q,r functions of the GEV distribution in a Bayesian setting. Gompertz distribution : provided in reliaR, flexsurv, extraDistr. flexsurv also provides hazard (h) and integrated hazard rate (i) functions. The shifted Gompertz distribution is implemented in extraDistr. Govindarajulu distribution : provided in lmomco. Gumbel distribution : provided in packages lmomco, VGAM, gamlss.dist, FAdist, extraDistr, reliaR, QRM, EnvStats and evd. actuar provides the raw moments and the moment generating function (mgf) in addition to the d, p, q, r functions. A fast random generator is available for the Gumbel distribution is implemented in Runuran as well as the density function. The reverse Gumbel distribution is implemented in lmomco and gamlss.dist. Huber distribution : Huber's least favourable distribution provided in package smoothmest (d, r), and in VGAM, marg, extraDistr (d, p, q, r). (generalized) G-and-K, G-and-H distributions : gk provides d, p, q, r functions for the g-and-k and generalized g-and-h distributions which are nonlinear transforms of the Gaussian variables. (generalized) Hyperbolic distribution : fBasics, ghyp, GeneralizedHyperbolic and HyperbolicDist packages provide d, p, q, r functions for the generalized hyperbolic distribution. QRM provides d, r functions for the generalized hyperbolic distribution. SkewHyperbolic provides the skewed Hyperbolic Student t-Distribution. fBasics also implements the standardized generalized Hyperbolic distribution. A fast random generator is available for the hyperbolic distribution is implemented in Runuran as well as the density function. Hyperbolic sine distribution and extension : gamlss.dist provides the sinh and the asinh distributions. ihs provides the asinh distribution. Generalized Power Hyperbolic sine distributions are provided in FatTailsR. Inverse Gaussian (also known Wald) distribution : d, p, q, and r functions of the inverse Gaussian are provided in statmod, extraDistr, SuppDists and STAR. LaplacesDemon provides d, r functions for the inverse Gaussian distribution. actuar provides d, p, q, r, m, lev, mgf functions for the Inverse Gaussian distribution. SuppDists also provides a function that returns moments, skewness, kurtosis. fBasics the normal inverse Gaussian and standardized normal inverse Gaussian distributions. The generalized inverse gaussian distribution can be found in gamlss.dist, QRM and HyperbolicDist. A random generator is available for the (generalized) Inverse Gaussian distribution is implemented in Runuran as well as the density function. GIGrvg generates random variables from the generalized inverse Gaussian distribution. frmqa computes p function of the generalized inverse Gaussian distribution. Johnson distribution : provided in SuppDists. K-prime distribution : sadists implements Gram Charlier, Edgeworth and Cornish-Fisher approximations for K-prime distribution for computing d, p, q, r functions. Kappa distribution : A 4-parameter Kappa distribution is provided in lmomco and FAdist. Kappa-mu distribution : provided in lmomco. Kendall's tau distribution : provided in SuppDists. Kiener distribution : a family of distributions generalizing hyperbolic sine distributions (see hyperbolic sine section), d, p, q, r, m provided in FatTailsR. Kolmogorov distribution : p function provided in kolmim. Kruskal Wallis distribution : provided in SuppDists. Kumaraswamy distribution : provided in packages VGAM, extraDistr and lmomco. (Tukey) Lambda distribution and its extensions : The generalized Lambda distribution (GLD) is well known for its wide range of shapes. The original Tukey Lambda distribution can be obtained as a special case of the generalized Lambda distribution. There exists different parametrization of GLD in the literature: RS (Ramberg-Schmeiser or tail-index param), FMKL (Freimer-Mudholkar-Kollia-Lin), FM5 (Five-parameter version of FKML by Gilchrist), GPD (gen. Pareto dist.) and AS (Asymmetry-steepness). The following packages implement such distributions (with d, p, q, r functions): gld (RS, FKML, FM5, GPD), Davies (RS), gb (RS), lmomco (FMKL), extraDistr (original Tukey). ecd provides the elliptic lambda distribution and its use for financial pricing. Tukey's H distribution : provided as a special case of Lambert W x F distribution. Lambda-prime distribution : sadists implements Gram Charlier, Edgeworth and Cornish-Fisher approximations for K-prime distribution for computing d, p, q, r functions. Lambert W x F distribution : LambertW package provides d, p, q, r functions as well as the first 4 central moments and a qqplot. Laplace (also called double exponential distribution) and asymetric Laplace distribution : provided in distr, lmomco, LaplacesDemon, VGAM, sgt, extraDistr, greybox and HyperbolicDist packages. LaplacesDemon provides the Laplace distribution parametrized by the precision parameter as well as the skew Laplace distribution. Asymetric Laplace distribution is implemented in ald, greybox. A fast random generator is available for the Laplace distribution is implemented in Runuran as well as the density function. smoothmest implements the density and the random generator. The skew Laplace distribution is available in sgt. LaplacesDemon provides the log-Laplace distribution. LASSO distribution : provided in LaplacesDemon. Linear failure rate distribution : provided in reliaR. Lomax distribution : see beta. Logit-normal distribution : provided in logitnorm. Log-normal distribution and its extensions : The log normal distribution is implemented in Base R (see above) and poweRlaw. The log normal distribution parametrized by its mean and its coefficient of variation is also provided in EnvStats. LaplacesDemon provides the lognormal parametrized by the precision parameter. The truncated lognormal distribution is provided in EnvStats with two possible parametrizations as well as in ReIns. The 3-parameter lognormal distribution is available in lmomco, greybox, EnvStats and FAdist. The package loglognorm implements d, p, q, r functions for the double lognormal distribution, as well as the raw moment, the expected value and the variance functions. EnvStats provides d, p, q, r functions for the zero-modified lognormal distribution with two possible parametrizations. Maxwell distribution : provided in VGAM. Minimax distribution : provided in minimax. Mittag-Leffler distribution : d, p, q, r functions provided in MittagLeffleR. Nakagami distribution : provided in VGAM. Pareto distribution : d, p, q, r functions are implemented in VGAM for the Pareto distribution type IV (which includes Burr's distribution, Pareto type III, Pareto type II (also called the lomax distribution) and Pareto type I) and the (upper/lower) truncated Pareto distribution. In an actuarial context, actuar provides d, p, q, r functions as well as moments and limited expected values for the Pareto I and II, the inverse Pareto, the 'generalized pareto' distributions, the Burr and the inverse Burr distributions, all special cases of the transformed beta II distribution. A fast random generator for the Burr and the Pareto II distribution is implemented in Runuran as well as the density. EnvStats and LaplacesDemon provides d, p, q, r functions for Pareto I distribution. extremefit provides the Burr, the Pareto II, mixture of Pareto I distributions and a composite distribution of two Pareto I distributions. lmomco, evd, fExtremes, extraDistr, QRM, Renext, revdbayes, FAdist, LaplacesDemon, qrmtools and evir packages implement the Generalized Pareto Distribution (from Extreme Value Theory), which is depending the shape parameter's value a Pareto II distribution, a shifted exponential distribution or a generalized beta I distribution. ParetoPosStable implements the Pareto positive stable distribution. The extended Pareto distribution is implemented in RTDE and the shifted truncated (to unit interval) Pareto is implemented in mbbefd. ReIns provides Burr, extended Pareto, generalized Pareto, Pareto 1 distributions and their truncated version. Pearson's distribution : Pearson type III available in lmomco and FAdist. A log-Pearson type III distribution is also available in FAdist. PearsonDS provides the d, p, q, r functions as well as the first four moments for the Pearson distributions: types I, II, III, IV, V, VI, VII. Pearson's Rho distribution : provided in SuppDists. Perks distribution : provided in VGAM. Planck's distribution : a random generator is available in Runuran. Phase-type distribution : provided in actuar, see also PhaseType for inference. Poisson subordinated distributions : provided in LIHNPSD (d, p, q, r, m functions). Power distribution : reliaR and poweRlaw implement the exponential power distribution. Proportion distribution : this is the distribution for the difference between two independent beta distributions. d, p, q, r functions in tolerance. Rayleigh distribution : provided in packages VGAM, extraDistr and lmomco. Generalized and logistic Rayleigh distributions are available in reliaR. Response time distribution : rtdists provides d, p, q, r functions for the (Ratcliff) diffusion distribution and for the linear ballistic accumulator (LBA) with different underlying drift-distributions (Normal, Gamma, Frechet, and log-normal). Rice distribution : provided in VGAM and lmomco. Singh-Maddala distribution : see beta. Slash distribution : provided in lmomco, extraDistr and VGAM. Spearman's Rho distribution : provided in SuppDists. Stable distribution : d, p, q, r functions are available in fBasics and stabledist, the functions use the approach of J.P. Nolan for general stable distributions. MixedTS provides mixed tempered stable distribution (d, p, q, r). FMStable provides (d, p, q) the extremal or maximally skew stable and the finite moment log stable distributions. Student distribution and its extensions : Base R provides the d, p, q, r functions for Student and non central Student distribution (see above). extraDistr and LaplacesDemon provides the Student distribution with location and scale parameters. LaplacesDemon provides d, p, q, r functions for the Half-Student distribution. sadists implements Gram Charlier, Edgeworth and Cornish-Fisher approximations for doubly non central Student distribution for computing d, p, q, r functions. The skewed Student distribution is provided in skewt, sn and gamlss.dist packages. The generalized skew distribution is provided in sgt. d, p, q, r functions for the generalized t-distribution can be found in gamlss.dist. fBasics provides d, p, q, r functions for the skew and the generalized hyperbolic t-distribution. The L-moments of the Student t (3-parameter) are provided in lmomco. Triangle/trapezoidal distribution : packages triangle, extraDistr, mc2d, EnvStats and VGAM provide d, p, q, r functions for the triangle or triangular distribution, while the package trapezoid provides d, p, q, r functions for the Generalized Trapezoidal Distribution. A fast random generator is available for the triangle distribution is implemented in Runuran as well as the density function. Tsallis or q-Exponential distribution : tsallisqexp provides d, p, q, r functions for two parametrizations of the Tsallis distribution and also implements a left-censored version. Tweedie distribution : the Tweedie distribution is implemented in package tweedie. Let us note that the Tweedie distribution is not necessarily continuous, a special case of it is the Poisson distribution. Uniform distribution : d, p, q, r functions are of course provided in R. See section RNG for random number generation topics. HI generates uniformly random points on a bounded convex set, in particular the unit ball. KScorrect provides d, p, q, r functions for the log-uniform distribution. Upsilon distribution : sadists implements Gram Charlier, Edgeworth and Cornish-Fisher approximations for Upsilon distribution for computing d, p, q, r functions. Wakeby distribution : A 5-parameter Wakeby is provided in lmomco. Weibull distribution and its extensions : Base R provides the d, p, q, r functions for this distribution (see above). The inverse Weibull is provided in actuar package and also the moments and the limited expected value for both the raw and the inverse Weibull distribution. FAdist implements the three-parameter Weibull distribution, while reliaR implements the exponential Weibull, the flexible Weibull, the generalized power weibull, the Marshall-Olkin Extended Weibull and the Weibull extension distributions. Furthermore, lmomco implements the Weibull distribution while evd implements the reverse Weibull distribution. The reverse generalized extreme value distribution are provided in gamlss.dist (d, p, q, r) and the shifted left truncated Weibull distribution is provided in Renext. The right truncated Weibull is provided in ReIns. Bivariate normal : d, p functions provided in bivariate. Bivariate Pareto : Bivariate.Pareto provides a random generator for the bivariate Pareto distribution. Multivariate Cauchy distribution : sn provide d, p, r functions for the multivariate skew Cauchy distribution, while LaplacesDemon provides d, r functions for the multivariate Cauchy distribution parametrized either by sigma, by the Cholesky decomposition of sigma, by the precision matrix omega or by the Cholesky decomposition of omega. Dirichlet distribution : Compositional, LaplacesDemon, MCMCpack packages provide d, r functions as well as a fitting function for Compositional. compositions, bayesm provide r function. Multivariate exponential distribution : while LaplacesDemon provides d, r functions for the multivariate power exponential distribution parametrized either by sigma, or by the Cholesky decomposition of sigma. Multivariate Gaussian (or normal) distribution : The multivariate Gaussian distribution is provided in the packages mvtnorm (d, p, r), mnormt (d, p, r), Compositional (r), compositions (r). pbv provides d, p functions for bivariate normal distributions. mvprpb computes the orthant probability of the multivariate Gaussian distribution. symmoments computes central and non-central moments of the multivariate Gaussian distribution. LaplacesDemon provides d, r functions for the multivariate normal distribution parametrized either by sigma, by the Cholesky decomposition of sigma, by the precision matrix omega or by the Cholesky decomposition of omega. Futhermore, tmvtnorm implements the truncated multivariate normal distribution. sparseMVN implements very fast algorithms to compute the density and generate random variates of a multivariate normal distribution for which the covariance matrix or precision matrix is sparse. cmvnorm implements the complex multivariate normal distribution (d, r). Finally, condMVNorm implements d, p, r functions for the conditional multivariate normal distribution. Furthermore, sn besides providing facilities for their distribution functions, sn allows the creation of S4 objects which encapsulate these distributions and provide facilities for plotting, summary, marginalization, conditioning, affine transformations of these S4 objects. mnormpow computes the expected product of the components of a multivariate Gaussian vector. Compositional provides random generator for the multivariate normal distribution on the simplex and multivariate skew normal distribution on the simplex. A random generator of the multivariate normal is provided in MultiRNG. Multivariate generalized hyperbolic distribution : QRM provides d, r functions of the standard and the symmetric multivariate generalized hyperbolic distribution. ghyp provides d, p, r functions of the standard multivariate generalized hyperbolic distribution. Multivariate generalized extreme value distribution : Both bivariate and multivariate Extreme Value distributions as well as order/maxima/minima distributions are implemented in evd (d, p, r). Multivariate Laplace distribution : LaplacesDemon provides d, r functions for the multivariate Laplace distribution parametrized either by sigma, or by the Cholesky decomposition of sigma. r is provided in MultiRNG. Multivariate logistic distribution : VGAM package implements the bivariate logistic distribution. Multivariate lognormal distribution : compositions provides r function. Multivariate Pareto distribution : mgpd provides the density for the multivariate generalized Pareto distribution of type II, while evd provides the density for type I.
Multivariate Stable distribution : not yet implemented? Multivariate Student distribution : The multivariate Student distribution is provided in the packages mvtnorm (d, r), mnormt (d, p, r), Compositional (r), QRM (d, r), bayesm (r). First two moments (m) and sampling (r) of the Truncated Multivariate t Distribution are provided in TTmoment. sn provides d, p, r functions for the multivariate skew t distribution. LaplacesDemon provides d, r functions for the multivariate Student distribution parametrized either by sigma, by the Cholesky decomposition of sigma, by the precision matrix omega or by the Cholesky decomposition of omega. r is provided in MultiRNG. Multivariate Uniform distribution : r is provided in MultiRNG. compositions provides a random generator on the simplex. Mixed ordinal and normal distribution : provided in OrdNor. One-inflated distributions : a generic distribution as well as special cases (OI-beta, OI-uniform, OI-GB1, OI-Pareto) are provided in mbbefd. The zero and one inflated beta distribution can be found in gamlss.dist. Zero-modified distributions : EnvStats provides the zero-modified normal distribution and the zero-modified lognormal distribution. Bernoulli-dist mixture : d, p, q, r functions for Bernoulli-exponential, Bernoulli-Gamma, Bernoulli-lognormal, Bernoulli-Weibull distributions are provided in qmap. Cauchy-polynomial quantile mixture : d, p, q, r functions are provided in Lmoments. Gaussian mixture : Functions d, r are provided in mixtools, bmixture package when dealing with finite mixture models. nor1mix, extraDistr, mclust, LaplacesDemon, KScorrect provides d, p, r functions for Gaussian mixture. EnvStats provides d, p, q, r functions for mixture of two normal distributions. bayesm provides d function for the mixture of multivariate normals. Gamma Poisson : provided in extraDistr. Gamma mixture : Ga GSM package provides d, p, r, bmixture provides d, r, evmix provides d, p, q, r.
Generic mixtures : there is an implementation via S4-class UnivarMixingDistribution in package distr. gamlss.mx uses the gamlss.dist package. gendist provides d, p, q, r functions for two-distribution mixture models working with any distribution defined by its d, p, q, r functions. Horseshoe distribution : provided in LaplacesDemon. Laplace mixture distribution : provided in LaplacesDemon. Log normal mixture : d, p, q, r functions are provided in EnvStats with two possible parametrizations. Normal-polynomial quantile mixture : d, p, q, r functions are provided in Lmoments. Pareto distribution : extremefit implements the mixture of two Pareto I distributions. Poisson Binomial distribution : poibin implements the Poisson Binomial distribution. Poisson lognormal distribution : poilog implements the Poisson lognormal distribution. Poisson mixture : provided in extraDistr. Poisson-Tweedie exponential family models : provided in poistweedie. Student mixture : The AdMit package provides d, r functions for Student mixtures in the context of Adaptive Mixture of Student-t distributions. MitISEM, bmixture package also provide d, r functions for mixture of Student-t distributions. von Mises Fisher (or Langevin) mixture : The movMF package provides d, r functions for finite von Mises Fisher mixtures. Absolute value or half distribution : Half-Cauchy, half normal and half-student are implemented both in extraDistr and in LaplacesDemon. Composite distribution also known as spliced distribution : Composite lognormal distributions provided in CompLognormal. Split-normal (also known as the two-piece normal distribution) not yet implemented. Split-student provided in package dng. evmix provides d, p, q, r of the following composite distributions: gamma-GPD, lognormal GPD, norma-GPD, Weibull-GPD as well as bulk models such as GPD-normal-GPD distribution. gendist provides d, p, q, r functions for composite models working with any distribution defined by its d, p, q, r functions. Compound distribution : d, p, q, r, m functions are implemented by Compounding where the parent distribution is any continuous distribution and the compound distribution is any distribution among the list: binomial, binomial-Poisson, geometric, hypergeometric, hyper-Poisson, Katti type H1/H2, logarithmic, logarithmic-binomial, logarithmic-Poisson, negative binomial, Neyman type A/B/C, Pascal-Poisson, Poisson, Poisson-binomial, Poisson-Lindley, Poisson-Pascal, Polya Aeppli, Thomas, Waring, Yule. kdist provides d, p, q, r functions of the K distribution. Discretized distribution : distcrete allows discretised versions of continuous distribution by mapping continuous values to an underlying discrete grid, based on a (uniform) frequency of discretisation, a valid discretisation point, and an integration range. transformed distribution : Newdistns provides G-transformed distributions for a selected number of distributions which includes Marshall Olkin G distribution, exponentiated G distribution, beta G distribution, gamma G distribution, Kumaraswamy G distribution, generalized beta G distribution, beta extended G distribution, gamma G distribution, gamma uniform G distribution, beta exponential G distribution, Weibull G distribution, log gamma G1/G2 distribution, exponentiated generalized G distribution, exponentiated Kumaraswamy G distributions, geometric exponential Poisson G distribution, truncated-exponential skew-symmetric G distribution, modified beta G distribution, and exponentiated exponential Poisson G distribution. gendist provides d, p, q, r functions for composite models, folded models, skewed symmetric models and arctan models working with any distribution defined by its d, p, q, r functions. Truncated distribution : A generic code snippet is available in the JSS . LaplacesDemon provides a generic function. For a given distribution, look at the corresponding subsection above. Wrapped G distribution : Wrapped provides d, p, q, r functions for a large family of distributions. Empirical mean, standard deviation and variance : base R provides mean(), sd(), var() functions to compute the mean, standard deviation and variance, respectively. Empirical skewness : available in agricolae, e1071, GLDEX, HyperbolicDist, modeest, moments, TSA, s20x, fromo, DistributionUtils, EnvStats packages. Empirical kurtosis : available in agricolae, DistributionUtils, e1071, EnvStats, GLDEX, HyperbolicDist, fromo, moments, TSA packages. The raw or centered moments are provided in e1071, moments. Empirical L-moments : L-moments are available in lmom, lmomco, Lmoments, GLDEX, EnvStats, trimmed L-moments are available in lmomco, and Lmoments, right-censored L-moments are available in lmomco, and cumulants in GLDEX. Empirical probability weighted moments : Probability weighted moments are available in EnvStats and fromo. Empirical cumulants : fromo provides centered and standardized cumulants. Mode estimation : Package modeest provides mode estimation for various distributions. Order statistics : Distribution function of the jth order statistic can be obtained with base R functions. ORDER2PARENT transforms distribution function of order statistics to its parent distribution function. Theoretical moments : The actuar package implements raw moments, limited expected values and moment generating function for base R distributions. HyperbolicDist provides the mean, variance, skewness, kurtosis, mode, raw and centered moments for the hyperbolic, the generalized hyperbolic and the generalized inverse Gaussian distributions. GLDEX also provides the mean, variance, skewness, kurtosis of generalized Lambda distribution. mvrtn provides mean, variance for left/right truncated normal distributions. lmomco provides L-moments (L), trimmed L-moments (TL), and right-censored [RC] for the following distributions: Asymmetric Exponential Power (L), Cauchy (TL), Eta-Mu (L), Exponential (L), Gamma (L), Generalized Extreme Value (L), Generalized Lambda (L and TL), Generalized Logistic (L), Generalized Normal (L), Generalized Pareto (L[RC] and TL), Govindarajulu (L), Gumbel (L), Kappa (L), Kappa-Mu (L), Kumaraswamy (L), Laplace (L), Normal (L), 3-parameter log-Normal (L), Pearson Type III (L), Rayleigh (L), Reverse Gumbel (L[RC]), Rice/Rician (L), Slash (TL), 3-parameter Student T (L), Truncated Exponential (L), Wakeby (L), and Weibull (L). Multivariate L-moments (L-comoments). Huang-Wan distribution : provided in LaplacesDemon. Inverse matrix gamma distribution : provided in LaplacesDemon. Inverse Wishart distribution : LaplacesDemon provides inverse Wishart distribution parametrized either by Sigma or by its Cholesky decomposition. LaplacesDemon provides the scaled inverse Wishart distribution. MCMCpack provides the inverse Wishart distribution. Marcenko-Pastur distribution : provided in RMTstat, MCMCpack and bayesm. Matrix gamma distribution : provided in LaplacesDemon. Matrix normal distribution : provided in LaplacesDemon. Normal Inverse Wishart distribution : provided in LaplacesDemon. Normal Wishart distribution : provided in LaplacesDemon. Tracy-Widom distribution : provided in RMTstat, MCMCpack and bayesm: supported beta values are 1 (Gaussian Orthogonal Ensemble), 2 (Gaussian Unitary Ensemble), and 4 (Gaussian Symplectic Ensemble). Spiked Wishart Maximum Eigenvalue Distribution : provided in RMTstat, MCMCpack and bayesm. Wishart distributions : Base R provides the r function for the Wishart distribution. MCMCpack, RMTstat, bayesm provides d, r functions, bayesm provides r function. LaplacesDemon provides Wishart distribution parametrized either by Sigma or by its Cholesky decomposition. White Wishart Maximum Eigenvalue Distribution : provided in RMTstat, MCMCpack and bayesm. Yang-Berger distribution : provided in LaplacesDemon. Zellner distribution : provided in LaplacesDemon. Unified approaches : The packages fCopulae, copula, and copBasic provide a lot of general functionality for copulas. Although lacking support for many existing copulas themselves, copBasic is primarily oriented around utility functions for the general mathematics of copulas as described in the well known introduction to copulas by Nelsen. Archimedean copulas : gumbel is a standalone package for the Gumbel copula fCopulae implements the 22 Archimedean copulas of Nelsen (1998, Introduction to Copulas , Springer-Verlag) including Gumbel, Frank, Clayton, and Ali-Mikhail-Haq. VGAM provides Ali-Mikhail-Haq, Clayton, Frank, Frechet copulas. copula provides Ali-Mikhail-Haq, Clayton, Frank, Gumbel and Joe copulas. The Frank bivariate distribution is available in RTDE. CDVine and VineCopula provide Clayton, Gumbel, Frank, Joe, BB1, BB6, BB7 and BB8 copulas. Nested Archimedean copulas are available in the HAC package. Generalized Archimedean copulas are implemented in the fgac package. BivarP provides cdf, pdf and survival function for Clayton, Gumbel and Frank copula. copBasic provides functions for Ali-Mikhail-Haq, Clayton, Frechet copulas. QRM provides pdf and random generator for Clayton, Gumbel, Frank, BB9 copula. Bivariate.Pareto provides a random generator for the Frank copula with Pareto margins. nCopula provides hierachical archimedean copulas. Blomqvist copula : provided in copBasic. Composition of copula : copBasic provides functions for composition of a single symmetric copula and composition of two copulas. Cubic copula : Not yet implemented? Dirichlet copula : Not yet implemented? Empirical copula : provided in copBasic and in HAC. GenOrd provides sampling function for multivariate discrete random vectors with a specified correlation matrix. Elliptical copulas : Gaussian, Student and Cauchy copulas are implemented in fCopulae for the bivariate cases. copula, CDVine, VGAM, VineCopula provide the Gaussian and the Student copulas. QRM provides pdf and random generator for Gaussian, Student copulas. Extreme value copulas : fCopulae provides the following copulas Gumbel, Galambos, Husler-Reiss, Tawn, or BB5. copula implements Gumbel, Galambos and Husler-Reiss. Eyraud-Farlie-Gumbel-Morgenstern copula : provided in VGAM, RTDE, and copula. Mardia copula : Not yet implemented? Nested copulas : arbitrary nested versions of copulas can be implemented in copula. Plackett : provided in VGAM, copBasic and copula. Vine copulas : Packages CDVine, vines provide functions for C- and D-vine copulas and VineCopula for general R-vine copulas. Basic functionality : R provides several random number generators (RNGs). The random seed can be provided via set.seed and the kind of RNG can be specified using RNGkind. The default RNG is the Mersenne-Twister algorithm. Other generators include Wichmann-Hill, Marsaglia-Multicarry, Super-Duper, Knuth-TAOCP, Knuth-TAOCP-2002, as well as user-supplied RNGs. For normal random numbers, the following algorithms are available: Kinderman-Ramage, Ahrens-Dieter, Box-Muller, Inversion (default). In addition to the tools above, setRNG provides an easy way to set, retain information about the setting, and reset the RNG. Pseudo-randomness : RDieHarder offers several dozen new RNGs from the GNU GSL. randtoolbox provides more recent RNGs such as SF Mersenne-Twister and WELL, which are generators of Mersenne Twister type, but with improved quality parameters. rngwell19937 provides one of the WELL generators with 53 bit resolution of the output and allows seeding by a vector of integers of arbitrary length. randaes provides the deterministic part of the Fortuna cryptographic pseudorandom number generator (AES). SuppDists implements two RNGs of G. Marsaglia. Quasi-randomness : The randtoolbox provides the following quasi random sequences: the Sobol sequence, the Halton (hence Van Der Corput) sequence and the Torus sequence (also known as Kronecker sequence). lhs and mc2d packages implement the latin hypercube sampling, an hybrid quasi/pseudo random method. sfsmisc also provides the Halton sequences. True randomness : The random package provides several functions that access the true random number service at random.org . RNG tests : RDieHarder offers numerous tests of RNGs based on a reimplementation and extension of Marsaglia's DieHarder battery. randtoolbox provides basic RNG tests. Parallel computing : Random-number generators for parallel computing are available via the rlecuyer package. See the HighPerformanceComputing task view for more details. Approximation of d, p, q, r functions : PDQutils provides tools for computing the density, cumulative distribution, and quantile functions of a distribution when the cumulants or moments are given, using the classical Gram Charlier, Edgeworth and Cornish-Fisher approximations. sadists is a showcase for PDQutils, providing density, cumulative distribution, quantile, and random generation for the doubly non-central t, doubly non-central F, K-prime, Lambda-prime, Upsilon, and sum of (non-central) chi-squares to powers distributions. Benchmark : A set of 28 densities suitable for comparing nonparametric density estimators in simulation studies can be found in the benchden package. The densities vary greatly in degree of smoothness, number of modes and other properties. The package provides d,p,q and r functions. Binned Empirical distributions : The HistogramTools package provides a number of methods for manipulating empirical data that has been binned into histogram form, including: (1) the empirical cumulative distribution function, (2) the empirical quantile, and (3) information loss metrics associated with binning. Empirical distribution : Base R provides functions for univariate analysis: (1) the empirical density (see density()), (2) the empirical cumulative distribution function (see ecdf()), (3) the empirical quantile (see quantile()) and (4) random sampling (see sample()). mded provides a function for measuring the difference between two independent or non-independent empirical distributions and returning a significance level of the difference. MEPDF provides functions to compute empirical density functions for multivariate data. probhat computes nonparametric probability distributions (d, p, q) using kernel smoothing. probhat supports univariate, multivariate and conditional distributions, and weighted data. Hierarchical models : Distributions whose some parameters are no longer constant but random according to a particular distribution. VGAM provides a lot of hierarchical models: beta/binomial, beta/geometric and beta/normal distributions. bayesm implements: binary logit, linear, multivariate logit and negative binomial models. Furthermore LearnBayes and MCMCpack provides poisson/gamma, beta/binomial, normal/normal and multinomial/Dirichlet models. Object-orientation : General discrete and continuous distributions are implemented in package distr respectively via S4-class DiscreteDistribution and AbscontDistribution providing the classic d, p, q and r functions. distrEx extends available distributions to multivariate and conditional distributions as well as methods to compute useful statistics (expectation, variance,...) and distances between distributions (Hellinger, Kolmogorov,... distance). Finally package distrMod provides functions for the computation of minimum criterion estimators (maximum likelihood and minimum distance estimators). See other packages of the distr-family (distrSim, distrTEst, distrTeach, distrDoc, distrEllipse). Transformation : Lebesgue decomposition are implemented in distr, as well as Convolution, Truncation and Huberization of distributions. Furthermore, distr provides distribution of the maximum or minimum of two distributions. See Object-orientation above. User Interface : AtelieR package provides a GTK GUI for teaching basic concepts in statistical inference, implementing all the R base distributions as well as the generalized Student, the inverse Chi-square, the inverse gamma and the lambda-prime distributions. Histogram, tail plots, distance estimation : DistributionUtils provides log-histogram, tail plots, functions for testing distributions using inversion tests and the Massart inequality. visualize provides functions to plot the pdf or pmf with highlights on area or when probability is present in user defined locations, as well as the graph is the mean and variance of the distribution. visualize provides lower tail, bounded, upper tail, and two tail calculations. visualize contains convenience functions for constructing and plotting bivariate probability distributions (probability mass functions, probability density functions and cumulative distribution functions). vistributions provides vizualition tools for a selected number of distributions. Paremeter estimation : lmomco and Lmoments focus on univariate/multivariate (L-)moments estimation. VGAM provides a lot of parameter estimation for usual and "exotic" distributions. gaussDiff provides a collection difference measures for multivariate Gaussian probability density functions Package MASS implements the flexible fitdistr function for parameter estimations. fitdistrplus greatly enlarges and enhances the tools to fit any probability distribution. EnvStats and fitteR also provides tools to fit most common distributions. flexsurv and msm provides a quantile function for a generic distribution based on numerical computation based on a dichotomic search. List and diagram of distribution relationship.